The Helikon soft shell jacket is a lightweight 660g which is capable of packing into a very small space. The fabric is 98% nylon, 2% spandex which is water resistant and coated with Teflon DuPont protector. The jacket provides protection against wind and light rain. The Teflon coating helps to protect against dirt and water on the outside. 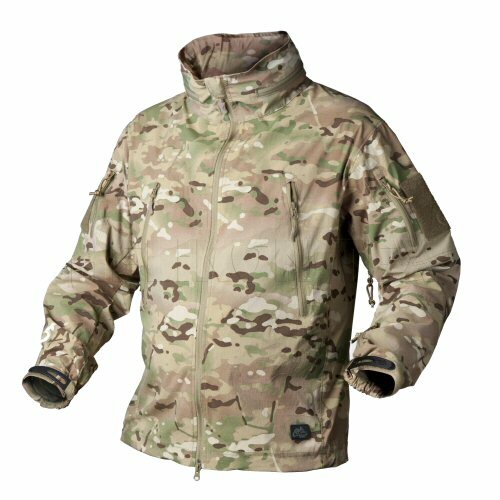 The jacket features two chest pockets with zipper, two upper arm pockets with zipper, small pocket on left forearm, inner pocket on left side, seat pocket with left and right opening. The chest and upper arm pockets have headphone ports. The jacket has an integral hood which can be stowed under collar. For keeping out draughts, the jacket has an adjustable hemline drawstring and velcro adjustable cuffs. Ventilation zips are located under left and right arms. Front zipper is a two way YKK zipper for convenient access to both top and bottom. The arm pockets are faced with loop Velcro for attachment of insignia. The updated form is more tightly fitting to the body than previous model to reduce the amount of fabric that would be caught between webbing and rucksacks and the body.